A beautiful retreat in Royal Oaks – Houston. A large pergola with an outdoor kitchen and multi-levels. A beautiful way to blend the yard into the living space. There are sitting walls all around the space to define the patio from the yard. The low-voltage lighting creates a nice atmosphere for entertaining. Giving the space an extra design perk is the multi-level flooring. The deck is a composite deck with accent lighting and is a great place to relax after a long day at the office. The travertine tile patio gives the project an upscale and clean look. The pergola allows for filtered sunlight to come though onto the space. Fans installed allow the homeowner to have a continuous breeze. A small but very functional kitchen allows for grilling and clean up and has plenty of storage space. Placing the kitchen right outside the door to the home, allows the homeowner to easily move food and dishes from the indoor kitchen to the outdoor kitchen. Space planning is important when considering what type of project needs to be built. Absolutely! The dining area is just off the kitchen and has a great view of the back yard. 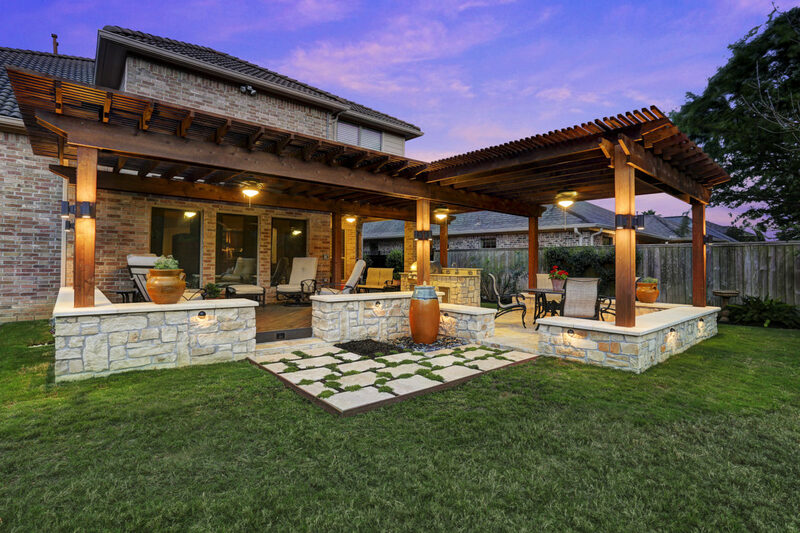 This 650 SF cedar pergola has it all – comfort and beauty!